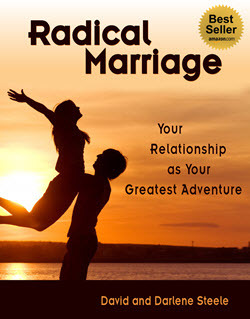 Radical Romance provides strategies for thinking outside the box to explode the romance in your relationship! So let’s start by defining a couple of important words. So Love is a feeling, an involuntary emotion that happens inside you. So romance is an action, it’s a conscious choice. This often happens by itself early in a long-term relationship, but over time couples become comfortable with each other and become complacent and the relationship becomes boring, stale and routine. We need routines. Routines can be comforting and make our life together run smoothly. But routines can also become suffocating and boring. So we need excitement and variety as well. So how can you spice-up your love life with Radical Romance? Stay tuned and we’ll show you how!